Mark Gardiner is becoming well known in the motorcycling community as a writer and traveler; he was the “star” of the very interesting DVD “One Man’s Island” (review), which was about his quest to race in the 2003 Isle of Man TT. It’s not clear what his connection to BMW motorcycles has been, but he does write a column in the UK’s Classic Bike magazine in addition to columns for Road Racer X, Cycle World and other print magazines. Laurel C. Allen is the Senior Editor of Road Racer X magazine, although it’s also not clear — to me anyway — what her connection to BMW racing motorcycles has been. Nevertheless, they’ve pumped out a handsome book, which makes a perfect pair — bookending, if you will — to the identically formatted mini-coffee table book BMW Motorcycles: The Evolution of Excellence that I reviewed not too long ago. BMW Racing Motorcycles starts with a very brief background on BMW’s entry into the motorcycle market after WWI. The story really starts with the incredible BMW R 32, first shown to the public in 1923 — a motorcycle that had all the earmarks and tell-tale signs of being a BMW, albeit without the flat-twin “Boxer” engine that has since become a hallmark of the brand. But you can take one look at the R 32 in the photo below and know immediately that it’s nothing less than a BMW. Motorcycle manufacturers — and there were scores in those days — used racing as a marketing tool, and BMW was as good at both racing and marketing as any. 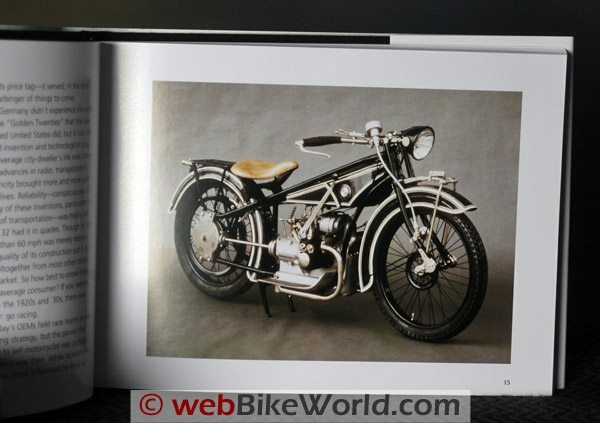 The book claims that BMW used their airplane technology to perfect their racing bikes, and as they won races, the BMW name and reputation was built. BMW designed supercharged engines, advanced suspension systems and more, all to improve their racing success. Most of these new technologies filtered down into their road bikes. The book is loaded with stunning photos and illustrations of BMW racing motorcycles and racers. I’ve always been a BMW motorcycle fan, and currently own 4 of the bikes, spanning 35 years. I own many books and other printed materials covering BMW history, so I’m surprised to find so many unique and beautiful photographs — many of which I have never seen before — in the pages of this book. This is a “mini-book”, meant, I suppose, for a small side table in an apartment or something, but it’s a real winner. The text is minimal, but at least the font is big enough for these tired eyes, and I have thumbed through the pages over and over, studying the very high quality photos, which have been meticulously printed on good stock. The book has only recently been published, so it touches on BMW’s sorely missed Dakar efforts, along with privateer racers, right up to the Brad Hendry R 1200 S, raced in GT Lights, Lightweight GP and Lightweight Superbike classes and the Moto-ST events of last year. My advice? 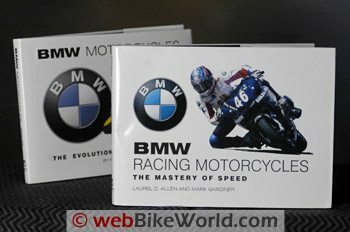 BMW Racing Motorcycles The Mastery of Speed is highly recommended for BMW owners and fans alike!